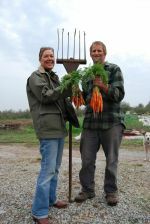 Pyramid Farms is run by Matthew & Lisa, we love living and farming "down in the hollow". Matthew oversees the veggies, and Lisa oversees the Goats, Chickens, and Flowers (and Matthew). Both of us are first generation farmers, yet both have familial influences. Lisa's loved to spend time on her Grandfathers egg and dairy farm, and we still use his truck to this day, and Matthew's mother rototilled and planted her huge garden 2 months before Matthew was born. Matthew's father dreamed of running a commercial nursery. We were born to do this!